Clusterphoque Cabaret celebrates acts—and individuals—you don't always see on stage. Wednesday, Jan. 30, 7 p.m.
Scix Maddix understands that the kind of acts you'd typically associate with a sideshow aren't going to draw the symphony and ballet crowd. In fact, he embraces that outsider sensibility—to the extent that he brings up performative flatulence. "In old-time vaudeville, they wouldn't clear out the theater between shows," Maddix says, "so they'd put on the worst act at the end of the show, so people would leave. In France, they would have the 'fartiste.'" 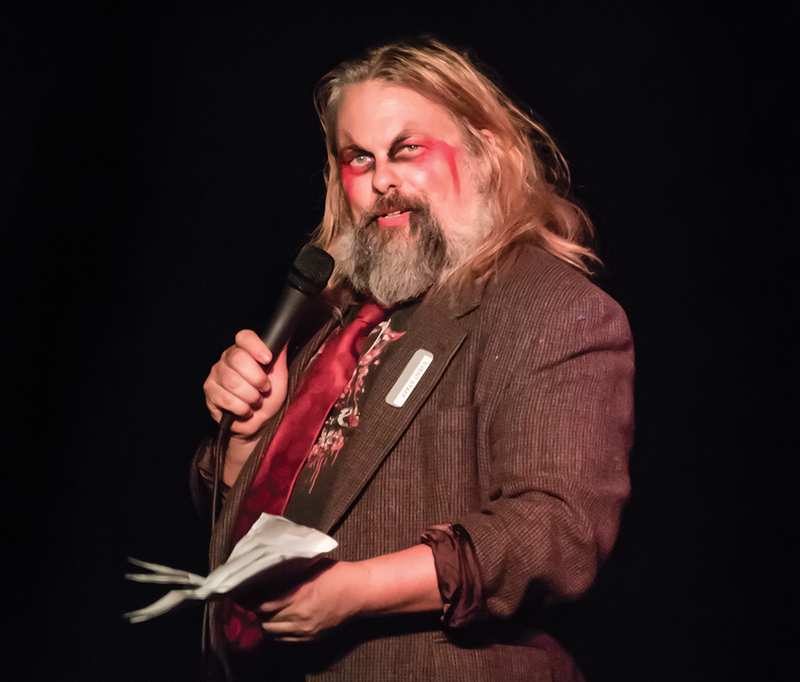 Maddix brings an infectious enthusiasm to talking about his role as ringmaster for the sometimes-oddball acts that make up Clusterphoque Cabaret, a collective of performers in fields ranging from fire-spinning and aerial arts to magic and burlesque. Most significantly, he's enthusiastic about this group as representing a spectrum of performers that don't always take center stage. "We've been collecting talent from all over, particularly from art forms that aren't particularly high-brow," Maddix says. "And especially attracting talent that you wouldn't typically expect to see, i.e. [those who aren't] thin, white, straight aristocratic people. We're really diverse. A lot of body types, a lot of racial diversity, a lot of orientational and gender diversity. And we find audiences really respond to that." It's not surprising that Maddix finds himself drawn to non-traditional performance. In his small Maine home town of South Paris, an internationally-renowned mime named Tony Montanaro had started a theater called the Celebration Barn, which drew performers and audiences from all over. "As backwoods as we were, we had this slightly bizarre avant-garde theater," he says. "So I grew up sort of teething on this." When he relocated to Utah nine years ago, he gravitated toward groups like the live performance cast of The Rocky Horror Picture Show at the Tower Theatre and the haunted house scene (he's part of the annual cast at Fear Factory). It was through a connection in the Rocky Horror cast, someone who was looking to put on a big show for her birthday, that the idea for Clusterphoque first began to percolate. "I happened to know, through Fear Factory, one of the guys there; his wife was a burlesque dancer," Maddix says. "I asked, 'Do you happen to know enough people to put on a show?' And she did. We pulled together so well, we decided to form a company of our own." That company, right from the start, represented the kind of diversity about which Maddix is justifiably proud. The way he looks at it, that demographic variety is both intentional, and not surprising. "From the beginning, we were going to cast the net wide and specifically embrace people who don't seem to be welcomed in other scenes," Maddix says. "I think that's one of the reasons we end up with such a diverse group—because we have people who start with, 'I'm an outsider, what can I do as a talent, because I want to be part of this.'" Helping develop those performers is as much a part of Clusterphoque's mission as actually putting on the shows, according to Maddix. The group conducts classes and workshops at the Art Factory for a variety of skills; Maddix himself teaches improv. "I feel that anyone who has an interest already has a talent, and we can help you find it, and help you develop it, and turn it into an act," he says. "People who do things to amuse their friends at parties, we can expand on that—give it some lighting, give it some sound. And people of all ages—we've got fairly young to quite senior—find it very liberating to step on stage. Terrifying, but liberating." Another function of gathering those who might feel marginalized is an awareness of avoiding content in their performances that could marginalize others. "We've got trans performers, and the intersection between trans performance and drag performance is occasionally complicated. This is the stuff we talk about," Maddix says. "So far, I think our track record is really solid. ... There was a venue that wanted us to do a Cinco de Mayo show, and we spent a lot of time kind of debating it, because we didn't have any Mexican performers in our show. Could we do justice to that subject? And we decided, no, we couldn't." At the moment, the goal of Maddix and Clusterphoque is raising the profile of their kind of performances beyond a fringe audience of friends and family members. "A lot of venues, when we first approach them, they don't want to pay us; they think giving us stage time is payment enough," he says. "If we were a band, you would pay us. We're entertaining the audience ... Very few of us make a living from this. One, that I know of. But we're making progress." "The biggest thing we do for the community," Maddix adds, "is demonstrate that we'll step on stage, warts and all, make fools out of ourselves, and everybody's having fun and cheering. That's ridiculously empowering."